Last fall, FutureMakers Coalition partners – including educators, workforce developers, business leaders, economic development professionals, government officials, residents and students – launched the FAFSA first! campaign to inform high school seniors and their parents about FAFSA and increase the region’s completion rate. Data, from Florida College Access Network, which serves as the data partner for FAFSA first!, shows that 4,794 out of 11,846 12th-graders completed their FAFSA applications throughout the region’s five school districts. For an equal comparison to 2015-16 school year FAFSA completion data, only 12th –graders up to age 18 and enrolled in a public or charter high school were included in the data set. The 2017-18 FAFSA became available Oct. 1, 2016, three months earlier than in past years, and now requires already filed tax return information. Previously, the FAFSA was not available until Jan. 1 for filing. It required income tax information for the most recent tax year, which often meant actual tax returns hadn’t yet been filed with the IRS. Each year, the federal government provides more than $150 billion in financial aid (grants, work-study and loans) for college and career school. To apply for this aid, every high school senior who plans to attend college or career school must complete the FAFSA. State governments and many colleges, career schools and private organizations also use FAFSA information to determine additional financial aid awards. Visit www.FAFSAfirst.org to learn more about the campaign, and for information and resources about FAFSA. Fact sheets are available for download in English, Spanish and Creole. 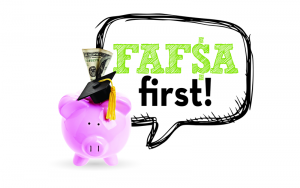 In addition, educators and others working with students and parents on FAFSA can access the FAFSA first! Practitioners Toolkit at www.futuremakerscoalition.com/toolkit, which focuses on effective implementation of FAFSA completion strategies. UNMAZE.ME: How to Create Student Academic Independence and Stay Connected!UNMAZE.ME: AP, IB, Dual-Enrollment: Determining What is Best for You!